This promotion is currently ongoing until further notice. Jackpotjoy Bingo is probably one of the most well known online bingo websites around especially with their Queen of the Bingo Barbara Windsor, great selection of bingo games, a vast choice of online slots (including the famous Rainbow Riches) and terrific promotions. This latest offer will see you being able to play for guaranteed prize money 3 times a day, every day with their Sapphire Bingo games. Taking part is really easy. 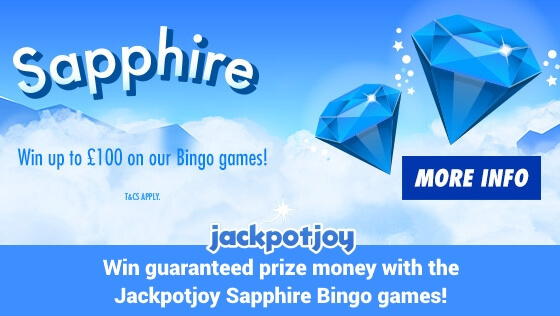 Just go to the Jackpotjoy Login and access your account and then play the Sapphire Bingo games during the sessions detailed below. If you are not a member then joining is quick and easy and when you play your first £10 you can get up to £50 in Free Bingo along with 30 free spins on Double Bubble. Terms and conditions do apply so check them out on their website first. 18+ only. As briefly mentioned above, there are 3 times during each day that you can benefit from these guaranteed prize money games. The first is the ‘Breakfast Bonanza’ between 7 am and 9 am. During these two hours, there will be 16 bingo games with the full houses guaranteed at £50 each. Next, you have the ‘Lunchtime Special’. Again you will have two hours of guaranteed bingo. This will be from 1 pm until 3 pm with a total of £1,500 in prize money up for grabs over another 16 online bingo games. Finally, there is the ‘Party Times’ session between 7 pm and 9 pm. As with the other sessions, there will be a total of 16 games played and this time the full houses are guaranteed at £100 each. 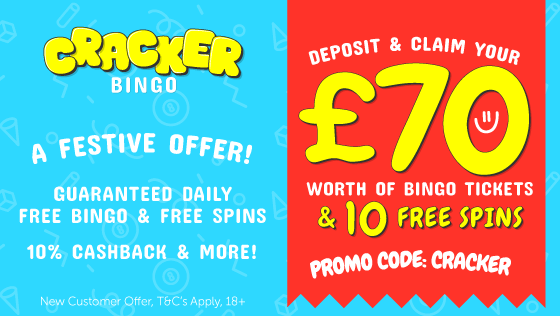 So, as you can see that is a total of 48 bingo games, over a period of 6 hours every single day that have guaranteed prize money over at Jackpotjoy Bingo. Why not join in today by clicking the button below. Good luck and have fun!